It was bound to happen. Olympians are, after all only humans. But oh, to be the one to whom it happens–embarrassing to say the least! 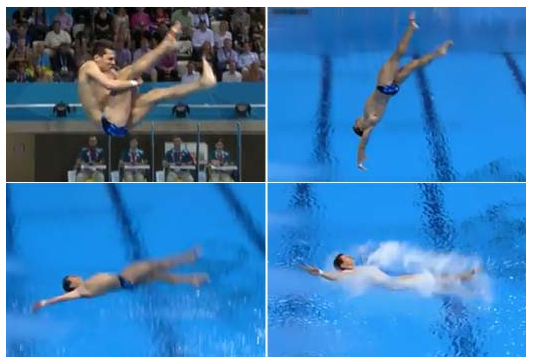 German Diver, Stephen Feck slipped as he was launching off the board and ended up flopping flat on his back. Ouch! The crowd erupted with laughter. Stephen lost a couple of toenails which surely hurt, but certainly not as painful as the humiliation of such a dive. He will be remembered as the one who scored perfect zeroes at the Olympics. Sadly, he withdrew himself from the competition because he was in too much pain. You can watch the video at NBC’s Olympic website. They are shutting down all unauthorized videos which are sure to go viral. Why is it our natural tendency is to rejoice when someone messes up? Is it because it makes us feel better? Or that even a well-trained athlete isn’t perfect? Whatever the reason, based on the following list of articles blanketing the internet, everyone will know the name of Stephen Feck. He’s not likely to receive any endorsements either. Our sympathies go out to Feck, and we pray God will use this in his life for good in some way or another. But what about when our marriages flop? We all know couples who seem to have it all together. From the outside it looks like their relationship is perfect. But we know it’s not. We’re all human and plagued with the same sin nature. It is who we are, and we have no hope of changing, but for the grace of God. He is the only One who can help us score big in our marriage. If we allow ourselves to slip into self-sufficiency thinking we’ve got this marriage thing down, be careful indeed. None of us are above temptations pull. Each day is a new opportunity to mess things up royally. This is why from the moment our feet touch the floor in the morning until our head hits the pillow at night we must be on guard. We will never arrive until God calls us home. We live in an imperfect world. Sure, the Olympics provide us with amazing athletes–one even scored a perfect 10 in 1976–but even their best efforts don’t prevent them from making mistakes and neither will ours. How grateful I am to know our mistakes aren’t caught on video for all the world to see! As you pray for your marriage today, whatever difficultly you’re facing, remember the grace of God that is available to help you through the challenge. And say a prayer for Stephen Feck too. I have a sense he needs the comfort only God can give. This entry was posted in Christian Marriage, Difficulty, Growing Strong Marriages, Olympics, Temptation, The Gospel & Marriage and tagged Feck, Germany, God, marriage, NBC, Olympic, Olympic Games, Stephen Feck. Bookmark the permalink. Tom and Debi Walter write at The Romantic Vineyard. They can see parallels to caring for your marriage in many everyday situations- and the Olympics are giving them lots! Keep on reading after you finish this article. There’s lots to “drink in” at the Vineyard! Debi, great post! I reblogged this one. Thanks for your and Tom’s devotion to one another and to marriages! Thank you so much. Your encouragement means a lot to us. So glad you’ve found our series helpful! Beautifully put. It breaks my heart to see an athlete mess up in the Olympics. I want them all to do their best and have the best athlete win. In marriage, I want everyone to win too! I take heart from sports where a single mistake doesn’t cost you the medal. MOST marriage oopses can be remedied with confession, repentance, and forgiveness, but you are right that we must rely on Our Father. Loving this Olympics series. Thank you, J. We feel the same way about marriages making. We’re so grateful our “oopses” don’t make it on the evening news–or worse, go viral on You Tube. Thanks for commenting.